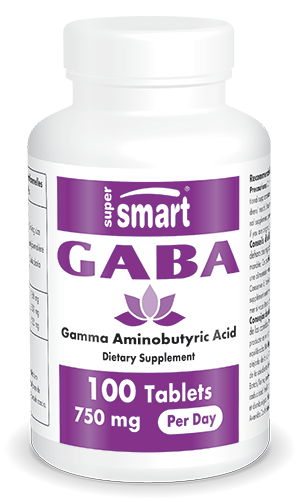 Gamma-amino-butyric acid, or GABA, is an essential molecule found naturally in the body. It is the main inhibitory neurotransmitter which means it plays an essential role in regulating neuron activity. In particular, it helps reduce excitation of nerve cells and prevent prolonged excitation. Alongside its essential role in neuron function, GABA supplement is also involved in promoting the development of certain neurons. While some situations require neurons to be in an excitatory state, it is essential to be able to control this and restrict it to short periods. Excitation of neurons results in numerous effects in the body including raised blood pressure. Generally-speaking, significant neuron activity can manifest in anxiety or stress. In the brain, this is managed by maintaining a precise balance between inhibitory neurotransmitters such as GABA and those with an excitatory function, such as the amino acid glutamate; the effects of the latter need to be counterbalanced by those of GABA. In some people, however, there is an imbalance between GABA and glutamate which causes dysfunction in the body. It could, for example, be a factor in epileptic seizures or cerebral ischaemia – insufficient supply of oxygen to the brain. With its relaxing effect, GABA is an important source of natural stress relief. An increasing feature of modern society, stress describes the collection of responses made by the body to external pressures. There are many stress factors which can be perceived very differently from one individual to another. Though it can be positive, stress can also have negative consequences including agitation, irritation, worry, low mood, and muscle tension as well as digestive and breathing problems. Excessive stress levels lead to a state of anxiety which manifests in fear and worry. If this anxiety is not addressed, it can result in certain health problems such as depression or alcoholism. It is therefore vital to tackle these effects as soon as the first symptoms appear. GABA’s potential for combatting stress and anxiety have made it the subject of numerous scientific studies, the results of which have highlighted its ability to reduce blood pressure in stressful situations. Researchers have also confirmed GABA’s sedative and anxiolytic effects at a cellular level which means it also offers relaxation, mood-enhancing and sleep-improving benefits. To combat the effects of stress and anxiety, it is important to maintain adequate GABA levels. Though it is naturally produced from glutamate in the body, levels of glutamate decline with age, and so too do those of GABA. This is why our dietary supplement has been specially formulated to provide 750mg of GABA per tablet, providing an optimal intake of this neurotransmitter, and an easy-to-take GABA dosage of one capsule a day, to be taken outside of mealtimes. To help maintain general well-being, you may also be interested in neurotransmitter precursors such as N-acetyl L-tyrosine and 5-hydroxytryptophan (5-HTP) , amino acid derivatives. You can find out more in our blog article: The neurotransmitter GABA: a natural stress-buster. Other ingredients: Acacia gum, calcium carbonate, dicalcium phosphate. Take one tablet a day between meals.